I'm back. I've read on many occasions about the inaccuracy/unreliability of the Amp gauges in the early generation of Fords and have taken note but my concern is my oil pressure gauge. Having only taken possession a few weeks ago and with the weather not cooperating (snowed last night), the few times I have been able to take it out I've noticed the oil gauge tends to wag between the 1/4 and 1/3 range (relative to the entire gauge). It's been pretty consistent with very little variation, if any, even at higher rpm's, cold weather etc.. I'm curious, since there are no associated numbers at the intervals, what the pressure is in that range and are there any other steps that can and should be taken prior to just replacing the gauge (which is what my level of knowledge has concluded). Thanx in advance. I would replace the sending unit first. From what your are saying the gauge is not reading to bad. If you ground out the wire that plugs into the sending unit and it goes all the way across the gauge is good. I would try to install an moderately priced mechanical gauge to determine what the actual pressure is. It is possible that your pressure is fine but the gauge just reads low. 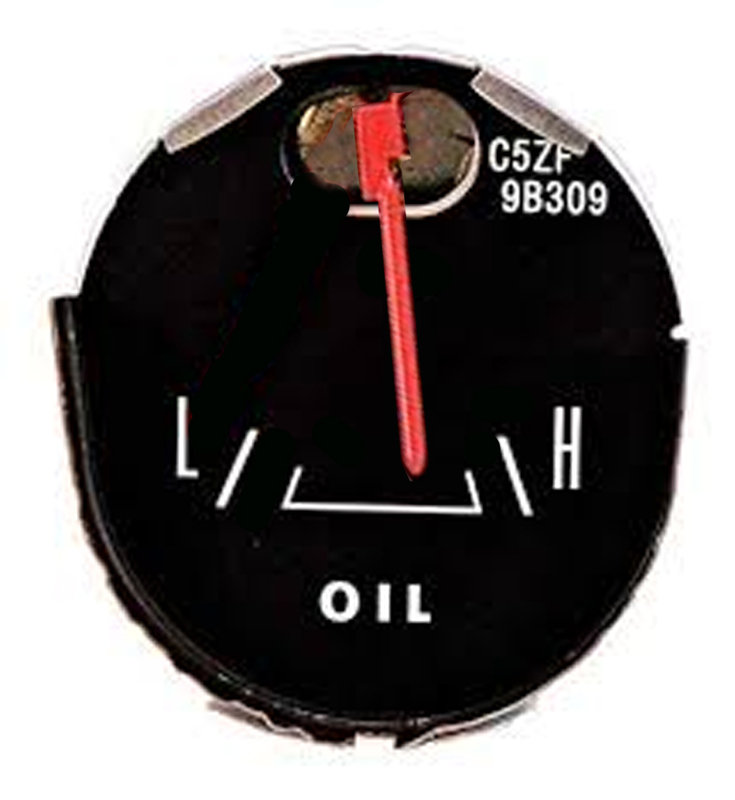 On the other hand, you may have a good gauge and are just running at a low pressure, which you will want to address. My engine runs at a very consistent pressure with the gauge reading about like the attached image. I really don't know what the exact pressure is. Thanx, I appreciate your time, I'll ground out the wire and if need be replace the sending unit. Would be nice if it was that and nothing more serious. Last edited by allsixofus; Yesterday at 07:09 PM. Where would you install the mech. gauge? My gauge reads the mirror opposite of the gauge shown to the low side. Maybe even lower. Thanx for your response. Quite a novice here. The stock oil guage actually works pretty well...even there are no numbers on the guage..only White Markers. It would have been better if there were some numbers on the actual guage itself..(Dopey Ford) ....but it works well enough believe it or not...and so does the Temp Guage..... unlike the useless AMP guage.....Ugh.. If you are going to install a gauge to check the pressure and then remove it, I would just remove the oil pressure sending unit and screw it in there. vegasloki and allsixofus like this. For an aftermarket gauge, I used to be a die-hard fan of mechanical oil pressure gauges. I never had any trouble with the nylon line running into the passenger compartment. However, the newer electric gauges with a wide sweep are really nice and much easier to install. These gauges are more expensive than mechanical or short sweep gauges, but I think they are well worth it. For a 66 Mustang, you could install a Shelby gauge pod on the dash for oil pressure and coolant temperature. Otherwise, I'm not sure where you could mount extra gauges. I've never owned a 65/66 Mustang. I've had my car 27 years, oil pressure has run about the same on my gauge before and after a rebuild, even with a new sending unit, all types of weather, more to the left of center. I think mine just reads lower. I just bought another '66 with 289, it reads just a little to right of center. As long as it is consistently between the white hash marks, closer to center than edge, I'm fine with it. 66ryan and allsixofus like this. There exist oil pressure sender extensions that are drilled and tapped for a second sender. 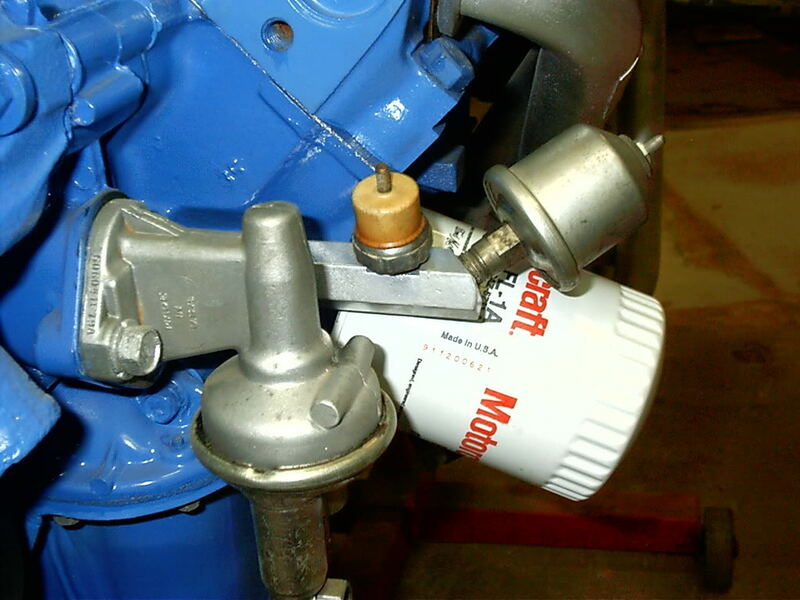 They aren't easy to find and some people construct their own with threaded Tees and fittings. The idea of them from the factory is so you could have a warning light AND a gauge. Another use for one is that you can hook up an actual mechanic's style pressure gauge AND the stock gauge and with some driving you can get a sense of what numbers go with what the stock needle points to. Last time I did this it was because I replaced a leaky sender and suddenly my gauge showed much lower pressure. So either I had been running with lower oil pressure than I thought or the new unit was wrong. Turned out the new sender was wrong (whew!). The third replacement sender showed a bit higher then the original but not by much so I went with that one. Having a dual extension is great but not actually necessary, you can swap out senders and gauges and get the same idea of what's going on. You don't really need to know the exact PSI every day even. Just where good consistently is so you will notice if it should should change. Which is all I do with numbered gauges anyway, a quick look to see everything is pointed where they usually do when cold, hot, on the interstate, etc. This is one of those stock sender extensions from a 1980's 351W or 460 truck now on my '67. Your existing sending unit should be attached to an extension that screws into the block. The end of the extension is cut off at about a 45* angle where the sending unit attaches. You can remove the sending unit and rig up a T fitting to attach the original sending unit and a mechanical gauge to. Then you can compare your stock gauge indication to a mechanical indication. FWIW- some people tend to think that their engine has problems if the oil pressure is less than 80 psi. Actually your engine only needs 10 psi per 1000 rpm to live a normal life. So 30-40 psi is perfectly acceptable. For electric gauges, and mechanical for that matter, I’m usually more interested that the needle is always about the same spot, I don’t start chasing things unless it suddenly shows something much different. If it’s been running at 1/3 the way consistently and doesn’t make noise I’d be fine with it. For peace of mind you can install a mechanical gauge and drive it around to see what it really is, I’d piggyback it so you have both running at the same time, and then you know approximately what the pressure is by the position of the factory gauge. If it’s 30-40 as mentioned by awhtx, that’s fine. If it bugs you and you want more you’ll be dropping the pan to change the oil pump and check bearing clearances. I’ve seen plenty of older cars that ran 25-35 and were fine. They were stock builds. 69 Mach One, 428CJ, 5 Speed, 3.91's. Do what rhutt says! The factory system has a sending unit (resistance? ), a wire (resistance? ), a constant voltage regulator (accuracy? ), more wire (resistance at the connection? ), the sending unit (accuracy? connections?) and a ground (good?) Any and all of those can affect the reading at your gauge. Get a mechanical gauge that you trust (yeah, I know, good luck with that) and find out how much pressure you have. Then see what your gauge reads to match it up to the mechanical/known pressure. This will let you know what is a "normal" reading even if it is 1/3. It might not be mid-range, but at least you'll know what you should expect. Tuning your reading is another operation altogether, but that's for a different thread. I've seen these before and never knew the reasoning. Thanx, appreciate your time to respond.